Thought I would start a new thread of my enlarged Snap Dragon design which has now been fIying for a number of years. Pencilled in as as the freebie pull out plan at the end of the month I thought it would fitting to make a video of it flying. This was taken yesterday up at my local patch, with my mobile phone duct taped to my transmitter I did manage to grab some footage. A bit on the breezy side as you will see but it does handle it ok, I will try and get some better footage with less wind and more sunlight in the up coming weeks. This flight is powered using a 3s 500mah Lipo which gives it a little more ompph, it is just as happy on a 2s battery using the same prop, you just have to work at the loops with the lesser voltage. 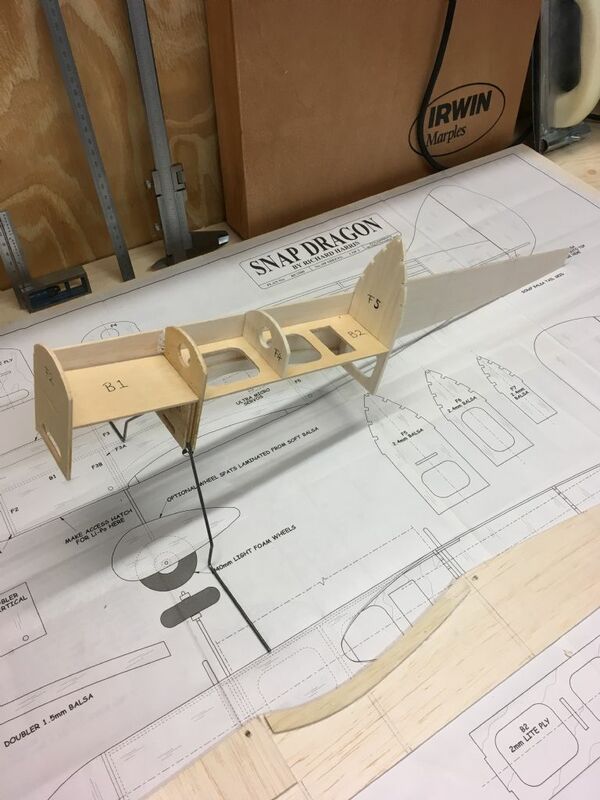 I will also add some extra photos of the build when the time arises, by that time I hope to have tested an aileron wing on it to, a little against the grain I know. As I had it to hand I've used a standard Spektrum receiver, there are smaller units available along with servos to save even more weight if budget allows. As I think of other things I will add. 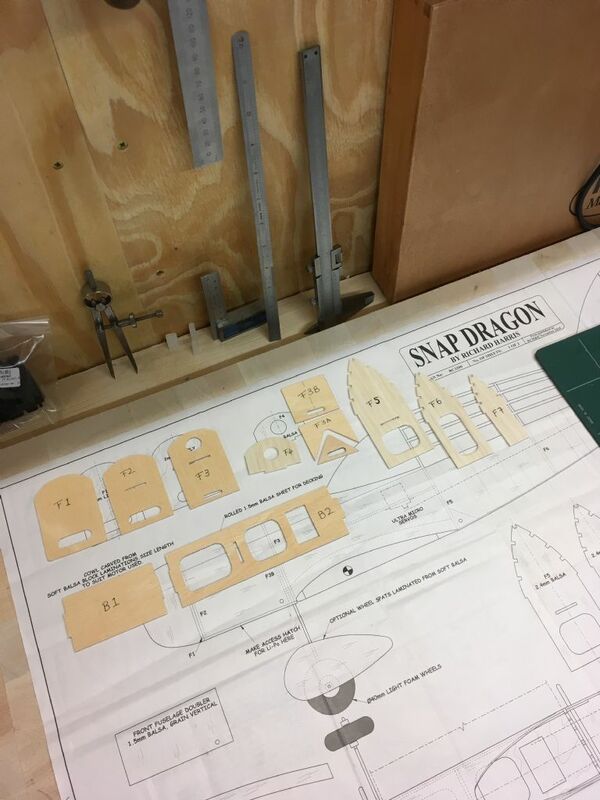 I have ordered all the wood to build the Snap Dragon from your free plans This will be my first build since recently returning to the hobby after a break of about 20 years!! It will also be my first venture into the electric side of things which I am really looking forward to. Thanks for sharing the video of your model flying it looks great in the air. I will post some photos of my model when complete. That's a lovely looking model Rich. Great stuff and welcome back to the hobby ​. the electrics are relatively cheap and ideal to dip your toe into the world of electric power. If you need any extra photos that may help you out during the build let me know as I did take a number that didn't get through the editors net. I've just ordered the motor, esc., propeller and battery for this build. I like your little Dragon very much! I am still waiting for the November issue, but it stands a good chance that I will be building it. Your video is of superb quality, I am very impressed, what did you use to produce it? I have been experimenting to get just such a result with a Mobius 2 cam mounted on my cap, but with the standard lens everything got way too small and difficult to see. After mounting an aftermarket lens with a longer focus length this got better, but I did not manage to keep the subject in view all the time. I think this is why I like the model, you can put it in the boot all rigged ready to go with no mess, it is a good starter model for anyone trying electric for the first time, simple, quick and cheap. I'm a firm believer in seeing a video of a model flying as it capture exactly how it flies rather than relying on still photos. In the past I have had to hand my girlfriend Deb who did most of the filming, now we have a 2 1/2 year old my time up at the field is only just starting to happen again and I'm generally on my own. So, to film I use my Samsung galaxy 8 to capture the footage, this is mounted on my transmitter around the area of the handle .I then fly and hold the transmitter a little higher than normal and follow the model around keeping my arms stiff. Obviously I cannot zoom in and out like this but I can keep it on screen for 95% of the flight and I try hard to fly close in because of this, I think I missed the top of the first stall turn. Somewhere I am sure I have footage of me flying a model showing me doing this as I have been asked before, if I can find it I will put it on this thread. It does take some practice but it works for me, a lot of others prefer the cap mounted method. A friend in Australia has a target on his cap that he looks through which is aligned to the centre of his recording screen, works very well. A friend in Australia has a target on his cap that he looks through which is aligned to the centre of his recording screen, works very well. Around 2000 I had my first digital camera, and tried to make flying shots with that, but the screen I had to use as viewfinder was hard to see and updated too slow in any case. So i made myself a "gunsight" type of aiming device, with ring and bead. Worked very well, but ofcourse I could not use it when flying at the same time. Richard I have to hand it to you, a truly good looking model. It does remind me of the Gee Bee Model D.
I have looked quite carefully at the plan, and thought that it would be better for me scaled up a little, to something like 48" span. I suspect that many other modelers are building models more frequently in the larger sizes as Lipos, motors have become more affordable. Particularly as larger models often are easier to fly. In the case of your design I see you have taken weight saving seriously, I am tempted to build the model just to see, if extreme weight management (by my battleship build) enable a viable easy fly small model to be built. That is one that does not need to reach mach 1 to remain airborne, disappearing into the distance in the twinkling of an eye. I'm certain a larger version will fly even better than the published size so I would be interested to know how you get on if you tackle it. I must admit I do fancy a double sized light version. I find that doubling the nose area with cross grain balsa rather than birch ply seems to keep the grams down and gives more than enough strength for a model like this. After Erfolg put the idea into my head I emailed Derick Scott and I now have a freshly printed twice sized set of plans for the Snap Dragon, have to say it seems a bit bigger than I thought. If I do proceed I will probably reduce the Dihedral and add some ailerons whilst trying to keep it as light as possible, I will ponder on the idea over the next few days. I think part of its charm is its small size. My only reason to go a bit bigger would be that I have a spare outrunner weighing 50+ grams, which is quite a bit heavier than the one you used, and some spare Hextronic500 servos weighing 7-8 grams each. I was thinking 20% larger. Max, I will be following your build, RH has delivered an excellent model for those who like smaller models. For myself, I still do fly smaller models, although at the club where I now fly, larger models are far more practical. On that basis i will be watching RH with the "Lowenmaul die Grosser" (no idea if the gender is correct). Restating, now that larger Lipos and motors are available at affordable sizes, larger models work well. They tend to tolerate longer grass, deal easier with stronger wind and for us olduns, you can see them at some distance. 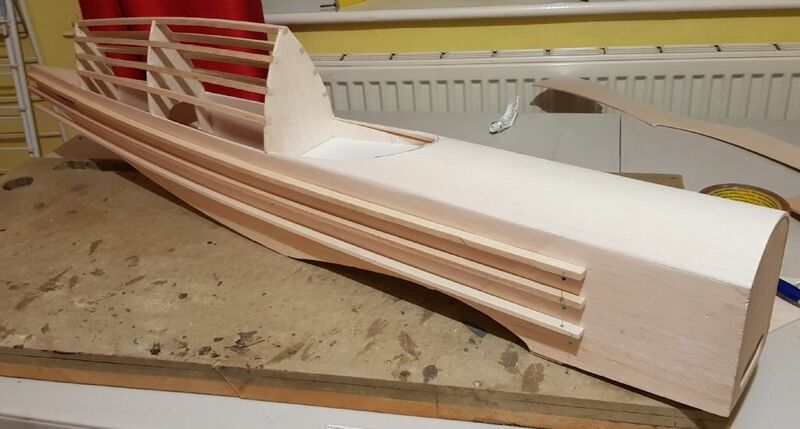 I decided to give the larger version ago and have made a start on the fuselage, each side is made from 3mm balsa sheet spliced to make up the extra length and depth needed. Balsa doublers have also been added from the bulk head to the TE position. I have also cut and bent up the aluminium UC (made from a scrapped aluminium ladder I salvaged) and machined up the wheel axles, collets. 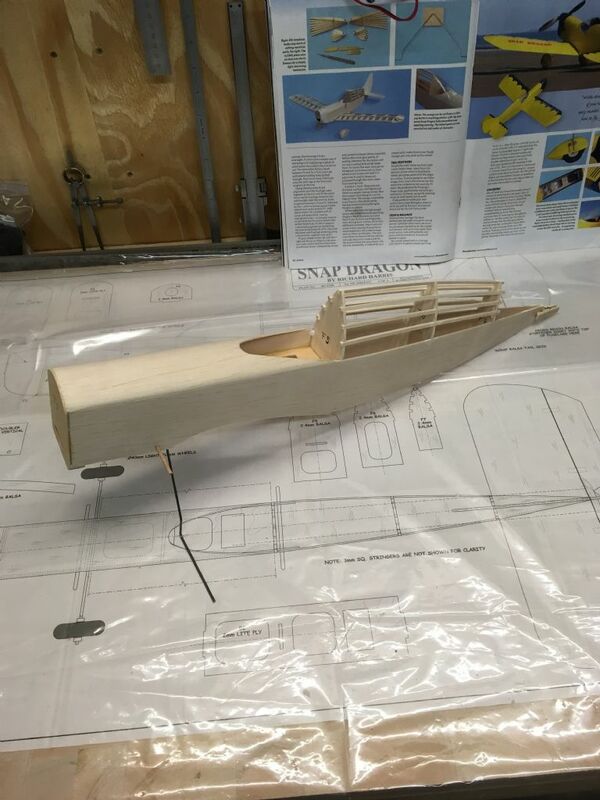 A little more progress on the fuselage this weekend. U/C mounts and wing nut plates are in along with the control snake outers, I pre rolled the front decking by soaking a 3mm piece of balsa in the bath over night then wrapped it around an old carpet tube which is about the right diameter, leaving it to dry out for a day before trimming and gluing in place. Rear stringers were also soaked over night before gluing into place, they have dried out in their resting position. Need to make up some balsa tri stock where the grain gives me the best strength rather than the commercial stuff. I'm keeping a close eye on the weight, as it stands the assembly weighs 330 grammes, I have only pinned in place possible fuselage dummy stringers, not sure if I will go with them as yet.